(Newser) – The Justice Department will soon make it easier for local law enforcement to seize cash and property—permanently—from crime suspects and reap the proceeds. 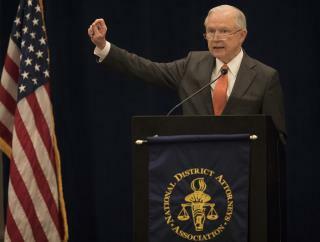 "We plan to develop policies to increase forfeitures," Attorney General Jeff Sessions told local prosecutors Monday in Minnesota. "No criminal should be allowed to keep the proceeds of their crime." Sessions said a shift will be announced this week that will increase the use of asset forfeiture, especially for drug suspects. The practice has been criticized because it allows law enforcement to take possessions, such as cars and money, without indictments or evidence a crime has been committed. A change would likely represent another reversal by Sessions of Obama-era Justice Department policies, reports the AP. Sessions is a lying, conniving, evangelical scumbag thief. One more "gift" to the American people from the Republicans, who want to turn the nation's police into an occupying army, with far reaching powers. This change Sessions proposes, is a violation of the Constitution, but we all know what they think of the Constitution -- that its toilet paper.